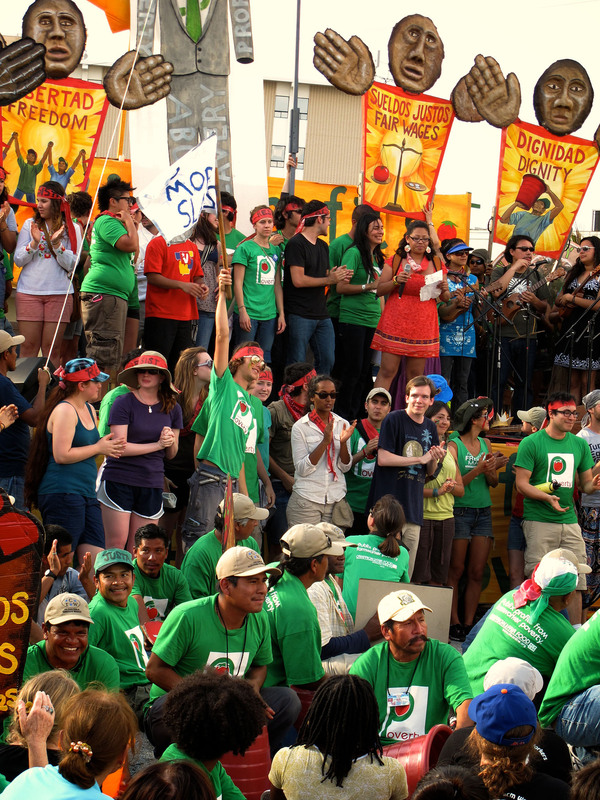 On March 5th 2011, the Coalition of Immokalee Workers called a mass convergence on the supermarket chain Publix in Tampa, Florida, as the culminating event of the Do the Right Thing Tour in which they asked supermarket chains to support labor reforms in Florida’s agriculture, as part of their Campaign for Fair Food. My longtime comrade-in-art David Solnit was called in to create one of his legendary massive street pageants with giant puppets and a sea of colorful props. I was sourced for the illustrative painting, including portable murals that were used in the pageant as cantastorie by the farmworkers while they testified onstage about the abuses they endure, and the corresponding rights they are demanding. 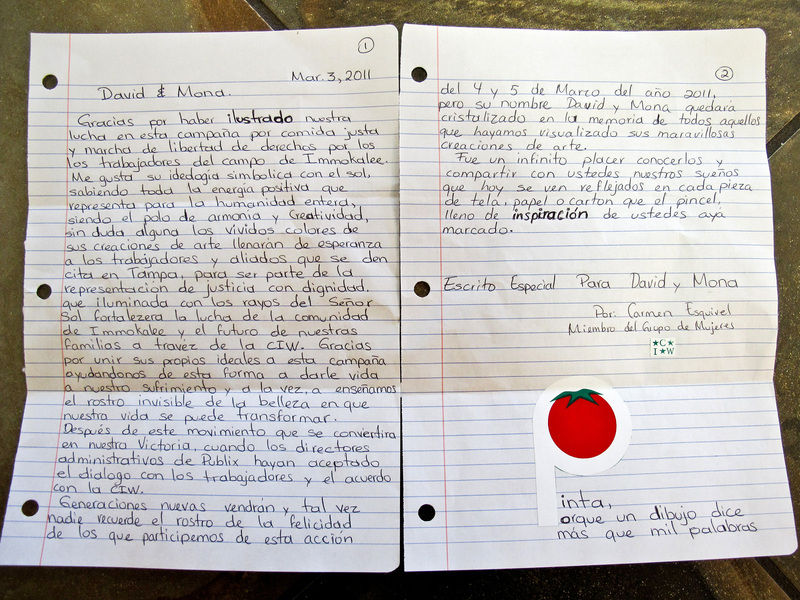 We first spent 10 days in Immokalee, the isolated center of the biggest tomato monocultures in the USA, at CIW’s headquarters. 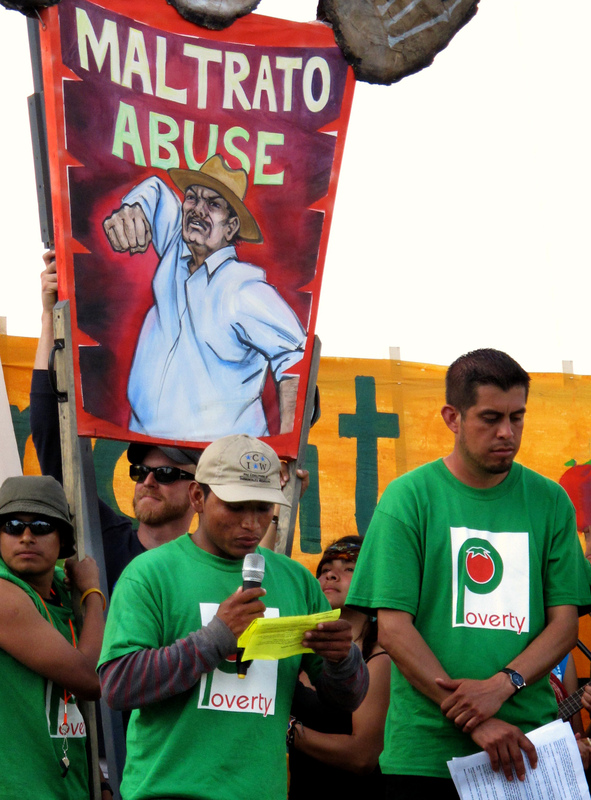 There, we created massive amounts of visual props together with the farm workers and members of the Student-Farmworkers Alliance, Interfaith Action, Just Harvest, and other supporters. Being in the middle of the fields and having the presence of workers who were not picked for day shifts, I was able to draw from life for the figurative pieces. 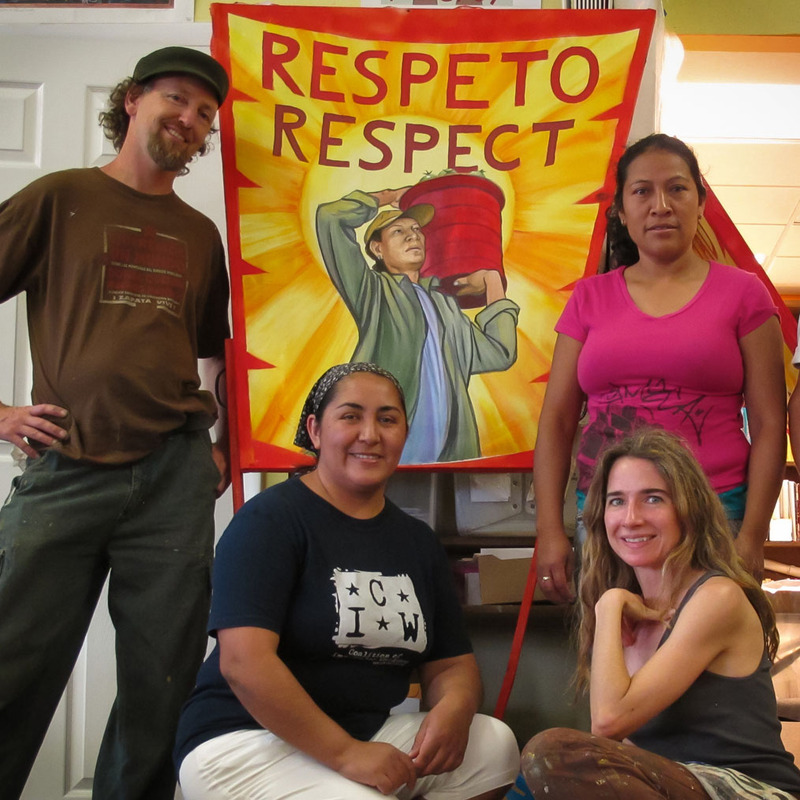 I drew a senior farmworker, Alberto, and the Coalition’s own stalwart Silvia Perez, who posed for two paintings. The Coalition of Immokalee Workers collectively formulated a messaging framework which was to be expressed in the street theater as 4 types of abuse that are happening in Florida’s fields, along with 4 corresponding demands to put an end to them. One of my tasks was to illustrate these pictorially within portable mural-puppets: poverty, slavery, physical abuse, and sexual harassment; to be contrasted with fair wages, freedom, dignity, and respect. After 10 days in Immokalee, we mobilized to Tampa, the site of the three simultaneous rallies which marched and converged to a single location, a supermarket of the ultra-conservative-led chain Publix, where the pageant took place. POP-UP SLIDESHOW: the day of action in Tampa “The theater began with a wave of farmworkers from Immokalee parting the crowd on their way to their place at the foot of the stage, which became an impromptu field where dozens of workers simulated the task of picking and hauling tomatoes by the bucket, while on the stage itself, four workers testified to the central abuses -- or "atrocities" in the words of Publix spokesperson Dwaine Stevenson -- of farm labor." 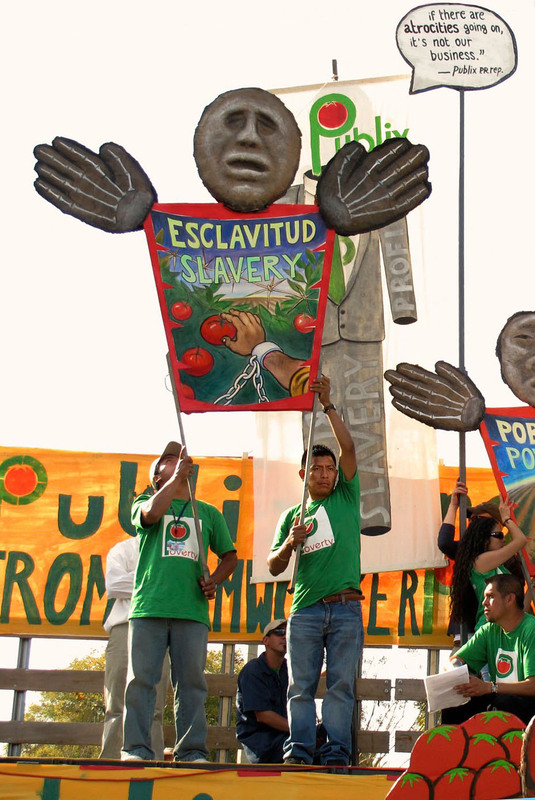 "Those abuses were represented by four twenty-foot tall puppets which, as the play progressed and farmworkers and their allies prevailed over the resistance of Publix to change, were turned, one by one, to reveal their opposite in a world where fundamental human rights are respected in the fields: From Slavery to Freedom, Poverty to Fair Wages, Abuse to Dignity, and Sexual Harassment to Respect."